They’re not talking about ethanol from corn, however, which has already proved wasteful and environmentally damaging. Instead eyes are on a handful of high-tech labs around the U.S. that are perfecting ways to make the equivalent of gasoline and diesel from the lowest life-forms on the totem pole: yeast, algae and bacteria. The challenge is to make enough of these fuels economically and in a form compatible with today’s vehicles. Once the next generation of biofuels becomes available, you could swing by the local energy station and fill up on a liquid that is virtually identical to gasoline. It would be made by U.S. companies, not shipped from the Middle East. And even though biofuels release carbon dioxide when they are burned, the organisms they are made from draw an equivalent amount of carbon dioxide from the air—making biofuels essentially carbon-neutral. Gasoline is refined from crude oil. Do-it-yourselfers who don’t want to depend on the oil companies have gone to elaborate lengths to run their old cars on biofuels, often by processing used vegetable oil salvaged from restaurant deep fryers and storing the result in a tank in the garage. On a commercial scale, however, today’s main biofuel is ethanol, also known as grain alcohol. It is made by fermenting corn kernels—a biological process similar to the one that gives us beer and wine. Put corn and yeast together in a big vat, and the yeast eats sugars in the corn, producing ethanol and water. Today more than 40 percent of the gasoline sold in the U.S. contains ethanol—typically premixed with gasoline to make a blend called E10 that is 90 percent gasoline, 10 percent ethanol. In a few areas, primarily the Midwest, a blend that is 85 percent ethanol (E85) is also sold for use in vehicles that have so-called flex-fuel engines. Corn has been the raw material of choice because fermentation is a proved process and because of government subsidies. The agriculture industry, which is strongly wed to ethanol, has been able to convince the government to back its interests. But most scientists agree that the ethanol experiment hasn’t gone very well. According to a study published by Cornell University scientist David Pimentel, 21 pounds of corn are needed to produce just one gallon of ethanol. And farming that corn requires half a gallon of fossil fuels. So not only could the production of corn-based fuels lead to food shortages, experts say, but the process is too inefficient to make a significant dent in our energy needs anyway. “When you look at what our ethanol production is and compare that against what our demand for transportation fuels is, we won’t get there,” says Virginia Lacy, a biofuels consultant at the Rocky Mountain Institute, a nonprofit energy policy organization in Colorado. Most researchers agree that it’s time to dump corn-based ethanol, but they have two opposing theories about how to proceed. Jay Keasling, a chemical engineer at the University of California, Berkeley, is one of several investigators trying to make ethanol and related fuels from plants such as switchgrass, which grows quickly and resists many pests and diseases. His biggest challenge is getting yeast and other experimental microbes to digest all of the plant, including the stalks, which are tough to break down. Another sticking point for Keasling’s method is that plants require lots of space, not to mention time, to grow: our demand for plant-based fuels could surpass our ability to produce them. Regardless of the method, scientists will have to improve on Mother Nature to make a successful biofuel, tinkering with existing microorganisms or even building brand-new ones. Dozens of start-ups are manufacturing fuels from novel strains of yeast, algae and bacteria. 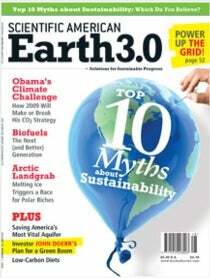 Several promise that by 2011 they’ll have made gasoline or diesel substitutes that can be pumped directly into cars. And although these biofuels will probably first be supplied preblended with traditional gasoline or diesel—much the way E10 is today—one day we may use them alone and say good-bye to petroleum-based gasoline forever. Keasling’s idea of fun is making microorganisms do strange things. “I want to see how much we can tweak cells and probe the limits of nature,” he says. Microbes are perfect little factories because they can be engineered to perform practically any chemical reaction. They also replicate on their own, whereas chemical reactions in the lab require a scientist’s near-constant attention. Since Keasling joined the Berkeley faculty in 1992, he has engineered bacteria to produce lifesaving malaria drugs and biodegradable plastics and to break down a range of environmental contaminants. Now Keasling has turned his attention to energy. In December 2008 he and his colleagues at the Emeryville, Calif.–based Joint BioEnergy Institute, one of three new Department of Energy research centers developing sustainable biofuels, modified a common yeast strain so that it could generate digestive enzymes normally used by four different microorganisms. The jazzed-up yeast could digest more of the cellulosic plant material, pumping out up to 10 times as much biofuel. Keasling grew up on a corn farm in a small Nebraska town, so he understands the downside of corn-based ethanol. Farmers make the fuel by chemically treating corn kernels to isolate the sugars and then feeding the sugars to yeast, which digests them and secretes ethanol.Not only do the corn husks and stalks go to waste, but ethanol production has driven up the price of the corn that is used for food by reducing its availability. Environmentalists have also become critical of using corn, sugarcane and other agricultural crops because they typically need lots of fresh water, fossil fuel–rich fertilizer and land to grow. Keasling is designing new forms of yeast, bacteria and archaea—three types of single-celled organisms—with special digestive systems that can break down the complex starches known as cellulose that are found not only in cornstalks but in many grasses, shrubs and trees. Because these plants aren’t food crops, they won’t detract from the food supply. If we ever hope to replace a large fraction of gasoline with biofuels, “it’s going to have to be through plants,” he says. Keasling is also looking to engineer microbes to produce what he calls “second-generation” biofuels such as butanol, isopentanol and hexadecane. Though similar in structure to ethanol, these fuels behave much more like gasoline. They contain more energy per volume; a car driving on a gallon of ethanol will go only 67 percent as far as a car on a gallon of gasoline; on butanol, it can go 80 percent as far. And unlike ethanol, these fuels can be used directly in jet and diesel engines. Other scientists argue that fermentation is not the best way to make fuel. Venter believes his more forward-thinking approach will prevail. The “most exciting” biofuel, he says, will be made from microbes that, when exposed to sunlight, consume carbon dioxide and turn it into energy directly—the equivalent of upgrading to a direct airline flight from one that had a long stopover. The idea might sound too good to be true, but Venter, who is known for his restless ambition, says it is possible. The earth’s energy comes from the sun. An hour’s worth of sunlight holds enough power to meet a year’s worth of human energy needs. But less than a tenth of 1 percent of that energy is captured by plants. Venter and other scientists are experimenting with photosynthetic microbes such as algae and cyanobacteria (sometimes referred to as blue-green algae). Not only do these microbes remove carbon dioxide from the air, they also grow quickly—some forms double in just 12 hours, whereas grasses and other large plants can take weeks or months to do so. Photosynthetic microbes also store plenty of fat, which forms the basis for fuel. Biologist Willem Vermaas of Arizona State University recently engineered cyanobacteria to accumulate up to half their dry weight in fat; just by opening up the cells, he can harvest the stored fats and convert them, in a few simple steps, into biofuel. Some plants, such as soybeans, also store fats and can be used as fuel sources, but Bruce Rittmann, Vermaas’s colleague at Arizona State, argues that photosynthetic microbes produce nearly 250 times more fat per acre. The concept of algae-based fuel is not exactly new, and it’s fraught with problems. In 1978 the DOE began trying to make biodiesel from algae, but the program ended 18 years later after the government concluded the concept wasn’t economically feasible. Algae and cyanobacteria are complicated critters: although they can grow in open ponds, unwanted microbial strains can easily contaminate the water and interfere with the growth of the fuel-making strains. Venter’s alternative is to grow algae in transparent, outdoor vessels called photobioreactors, but these containers are expensive to build and maintain. They must also be constructed so that the right amount of sunlight hits them—too much or too little slows growth. What is more, harvesting the microbes and sucking out the stored fats requires environmentally unfriendly solvents, and new organisms have to be grown to replace the harvested ones. Venter says that his newest company, Synthetic Genomics in La Jolla, Calif., is well on its way to overcoming one of the hurdles: his microbes can be reused multiple times because he has engineered them to release fat rather than store it. In addition, he has found a way to prevent the unwanted spread of these organisms should they ever be accidentally released from a facility; they can survive only if they are fed a chemical they cannot produce on their own. Synthetic Genomics will soon be testing the approach on a commercial level. “We’ve had some really major breakthroughs,” Venter says. Other companies are well on their way, too. San Diego biotech firm Sapphire Energy claims it could be selling gasoline made from algae by 2011. Solix Biofuels, a start-up based in Fort Collins, Colo., plans to have its first pilot facility running by this summer. “A lot of people said we’d never fly, we’d never walk on the moon, the lightbulb would never work. What it takes is a lot of discipline and diligence to move forward,” says Rich Schoonover, Solix’s chief operating officer. So which kind of microbe will save the earth? Samir Kaul, a partner at Khosla Ventures, a San Francisco Bay Area venture capital firm that backs start-ups pursuing both approaches, says the companies that survive will be the ones whose fuels can compete with oil at $40 a barrel. Venter agrees: “I think that’s going to end up being the biggest challenge: Can we build these really large facilities and do it in a cost-effective, environmentally friendly way?” It’s a high-stakes game, and even the scientists are hedging their bets; some of Venter’s projects involve cellulosic biofuels, similar to what Keasling is doing. And despite Rittmann’s allegiance to cyanobacteria, he is also working with other microbes. Whoever produces abundant biofuels could end up making more than just big bucks—they will make history. “The companies, the countries, that succeed in this will be the economic winners of the next age to the same extent that the oil-rich nations are today,” Venter says. He even suggests, in his characteristically unabashed way, that those companies and nations could end up igniting a second industrial revolution—one fueled by the need to undo the environmental consequences of the first.